Diamond Vapor slot! Well, if I asked you to name an outlandish and unusual slot theme we would probably sit about for hours before this was suggested! The subject of the game is that more modern form of consuming nicotine for the 'healthy' imbibing of their drug otherwise known as 'Vaping' - more details about what this is here. This form of inhaling flavoured vapour is represented on the reels via various coloured bottles of vaping fluids and the cool young dudes that presumably enjoy this past time. There are 10 paylines over 5 reels and a game nearly as volatile as the oils they heat up in their vaping devices! Endorphina have never been afraid of quirky and outlandish themes though as we saw in their Twerking Slot and very good too. I am already dreading a copycat theme from another developer along the lines of 'Vietnamese Vapers' in order to add the seemingly obligatory Oriental edge to any subject! The game's theme icon forms the Wild on all reels paying 100x stake for 5-of-a-kind, then the vaping device 50x down to the lowest scented vape oils at 10x stake. 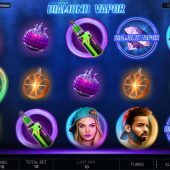 In keeping with the cool hipster theme the game's scatter is a neon sign for a 'Vape Bar' and appears on all reels paying 200x stake if landing all 5 and naturally triggering Diamond Vapor slot's bonus game. The soundtrack is uber-cool funky dance beats that they may play in background of any 'Vape Bar', whatever that is! So, you have hit the Vape Bar (well, 3 in one go!) and have been rewarded with 10 free games. Here we will find a bonus enhancement that's a hybrid of Novomatic's Book Of Ra Deluxe (expanding scatter symbols in free games) and any game where Wilds expand only in free games. In this game though any symbol can expand if it forms a win on consecutive reels from left-to-right. In essence this means an effective 10x multiplier on any win you land as you are paid it over all 10 pay lines. The spins can retrigger too, although the scatters don't expand!